Victor Carrasco. Photo by Jim McCue, Maryland Jockey Club. From a Maryland Jockey Club release. Journeyman rider Victor Carrasco, the Eclipse Award-winning apprentice of 2013 sidelined for the past nine months by injury, will launch his latest comeback with a pair of mounts on Sunday’s 10-race program at Laurel Park. 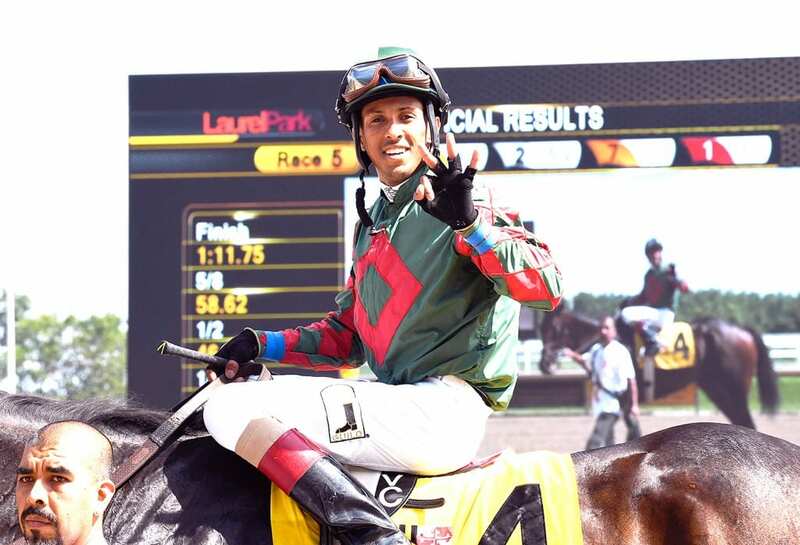 Ranked among Maryland’s leading riders since coming to the U.S. from his native Puerto Rico in March 2013, Carrasco has not ridden in a race since breaking the fibula and tibia in his right leg in a five-horse spill at Delaware Park Sept. 14, 2017. Carrasco, who turns 26 June 28, is named aboard Three Ms Racing’s Mythos, a 7-year-old gelding trained by Jonathan Maldonado, in Sunday’s fifth race, a $17,000 claiming event for 3-year-olds and up going seven furlongs, and Fitzhugh LLC’s Maryland homebred Another Broad, a 3-year-old filly from the barn of trainer Mike Trombetta, in Race 7, a $33,000 waiver maiden claiming event at six furlongs. Carrasco was hurt when his mount, Really, fell while leading the field in the one-mile turf race. Four other jockeys were thrown including 53-year-old Jose Ferrer, who was able to return from major internal injuries over the winter in Florida. A painstaking rehabilitation followed for Carrasco that included swimming, cycling, jogging and extensive physical therapy at the Dorsey Hall Medical Center in Ellicott City, Md., part of Medstar’s National Rehabilitation Network. He first began getting back on horses again May 22. In his brief career Carrasco has been sidelined by a broken hand in 2015, foot injury in 2016 and fractured shoulder blade in 2017. His four career riding titles have come during Laurel’s 2013 fall, 2015 summer and 2017 summer stands as well as the 2015 spring meet at legendary Pimlico Race Course.